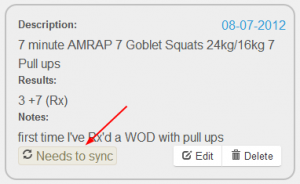 I just added a new feature to http://my.wodtracker.net that a few users have needed in the past – the ability to force all of your WOD history and personal records to sync. When you change devices, your data won’t automatically sync when you re-download the app and sign in for the first time. That is a feature I’ve been trying to figure out how to implement in the app, without duplicating any of the data on your device. It’s a bit trickier than I originally anticipated. When you sign in to the website, on the far right side of the screen, you’ll see a box with your user name. Click on that box and you’ll see two options. Click on the profile option. On the user profile page, I’ve added two new options. These options allow you to set make your data sync the next time the device syncs with the web. When you click on one of two buttons, your data will be reset so that it will be pushed down to your device when the device attempts to sync. You’ll see a message letting you know things were ok. It will disappear after about 5 seconds. When you go back to your activity view (of either your PRs or WOD history), you’ll notice that the “sync state” will appear as below. When the data has been synchronized between your device and the web, the “sync state” will revert back to its normal state. It is important to note that if you have data on your device and you use these options, you will have duplicated data on your device. I can’t undo that. You will have to manage whatever mess the data is in after that. I don’t expect you to use this feature unless you’ve uninstalled the app from your device and reinstalled it, gotten a new device and all of your data is gone, or flashed a new ROM (if you’re rooted). If you haven’t done any of the above things, use extreme caution when using this feature! Posted July 24, 2012 by Pete Wood & filed under pro, sync, update. There were only two persistent bugs in the past few months and they were others related to the database being locked for a small amount of the WOD Tracker user population (less that 5%). After studying and debugging, I believe I’ve figured out a solution. The reliance on the database has been decreased for sharing your WOD results on Facebook (or any service really). The import from an RSS feed no longer uses the database at all. The code executed when trying to import from an RSS feed has been completely redone and should be much quicker now. This will depend on your connection. The only new feature introduced in this update is the ability to create a PR directly from the Named WOD screen. Thank you for the suggestion! If you have any suggestions for the app, let me know! 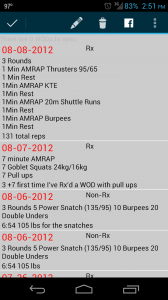 Posted March 26, 2012 by Pete Wood & filed under named wods, update. 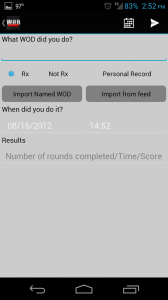 The 2012 Crossfit Open WODs can now be found in the Named WOD database. 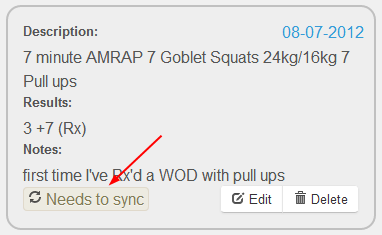 Normally, I wouldn’t need to update the app for new WODs to show up in the Named WOD database but since this added a new category, an update had to be published. After you download this updated, you’ll need to go into the Named WODs, click the menu button and then select “Update Named WODs”. I just published 1.4.6 to the Android market. In my last update, I broke the search functionality in the app. I’ve fixed that. While I was modifying the code, I made a few other changes as well. When you check the “PR” checkbox on the WOD tracking screen, if you’ve pulled the WOD from the Named WOD database, it now correctly attaches a category to it. Previously, the category was always set to “uncategorized”. I removed the search option from the menu on the WOD tracking screen. I removed the double quotes around the Named WOD name when you choose a WOD from the Named WOD database. This was causing the sorting on the history screen to be out of whack and just looked wrong. 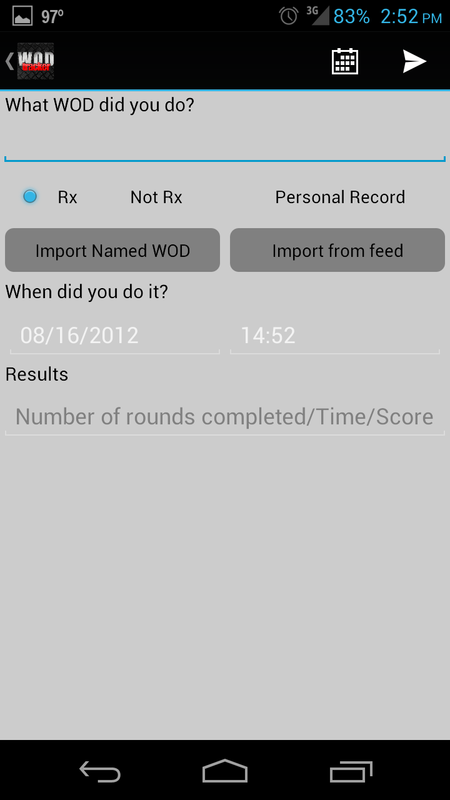 I’m pushing an update to the Android version of WOD Tracker Pro. This release contains a few new items. The auto-sync got a major overhaul and should be a lot more stable and reliable. The Facebook sync is now more reliable. The buttons now have rounded corners and are a bit darker than the normal Android button look. The background is now a light gray, instead of the default Android black. Some of the keyboards have been refined. When entering your RSS feed URL, you’re shown the “url specific” keyboard. This keyboard shows you the “/” and “.com” keys that are relevant to typing in a URL. On the percentage calculation page, you’re shown the numeric keyboard since you should only be entering numbers in the input area. Perhaps the largest change is the new default screen. I’ve added a screen with buttons that reflect the main functions of this app. Some of the functions may be unknown to you. This new screen is an attempt to make sure that the users of the app know each feature the app has in it. The app now has built-in bug tracking. This change is transparent to you but provides me with some important debugging information when your app crashes. No additional permissions are required. Posted February 25, 2012 by Pete Wood & filed under iOS. Porting the app over to iOS has always been on my radar. Tonight, I made a significant leap in that direction. I’ve been looking at buying an Apple computer since I learned that if I wanted to port my app over to iOS, I had to develop it on a mac. I’ve been all over Craigslist and eBay looking for a good, used computer that I was comfortable buying online. I was so close to buying a used mac on eBay about 3 weeks ago but was not completely comfortable spending that kind of cash online. Well, tonight, I did it – I finally bought an Apple computer. I am beginning the process of porting the app over. I know a few people in my box will be happy to know the process has begun. I’m very excited! Learning to develop for Android was great, but now, I’m entering a completely new arena – new OS, new programming language and a new platform. This is going to be awesome! Posted February 22, 2012 by Pete Wood & filed under named wods, update. I just added the following WODs to the Named WOD database. You can find instructions on updating the named WODs here. “The Bear Complex” – 5 rounds of each movement. No resting the bar on the ground during the movements. Rest between rounds if necessary. 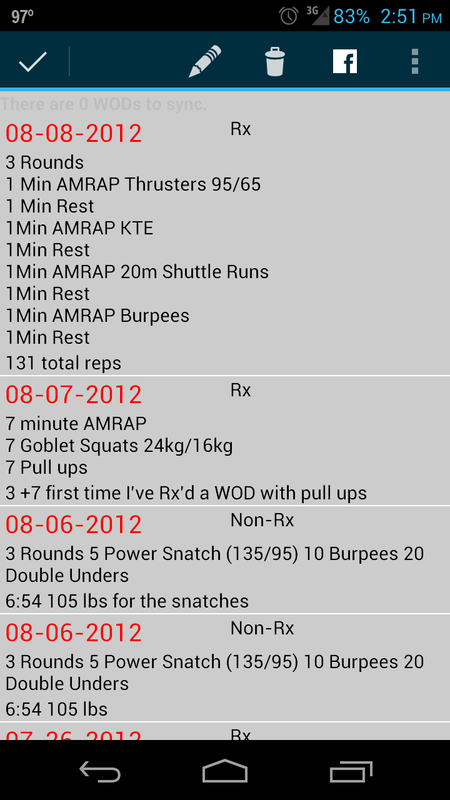 1 Power Clean, 1 Front Squat, 1 Push Press, 1 Back Squat, 1 Push Press. “The Chief” – Max rounds in 3 minutes of: 3 power cleans 135/95, 6 Push-ups, 9 Squats. Rest 1 minute. Repeat for a total of 5 cycles. “Run and get your Fran” – For time. Thrusters 95/65, Pull-ups. 21/15/9. Station your bar and plates 200 meters from the pull-up station. Start at the pull-up station, sprint and retrieve one piece of equipment at a time (total of 3 sprints). When all pieces are at the pull-up station – begin!